This project is a race purpose only, special construction, partially streamlined, blown fuel, land speed motorcycle designed by Guy Caputo and chassis built by Terry McIntosh of McIntosh Machine in Xenia, Ohio. Joe Timney of Delaware Chassis and President of the East Coast Timing Association (E.C.T.A.) is the designer and builder of the special Drogue Chute deployment system that will be used to help stop this machine on the 1 mile short course. This project is a collaborative effort under the supervision of Guy Caputo and consulted upon by many industry leaders in the field of Straight line, Drag Racing and Land Speed Racing. This never before tried project will be the culmination of almost a decade of Land Speed Racing experience by Guy Caputo and his team of sponsors. It is projected for a maiden test run in 2012 at Loring. There is no better track than Loring's 13,000 foot runway to test a 300mph vehicle on the asphalt short track. These are the four most critical components for success in this project. Guy Caputo set and reset most every Nitrous Fuel Land Speed Records in both Modified and Altered Partially Streamlined classes from 1650cc and above since 2005 in the 1 mile short track at Maxton. His experience combined with industry leaders and other top racers in the field of straight line, Drag Racing and Land Speed Racing will be used to successfully overcome these and many other issues. "No need to re-invent the wheel" says Guy, "we just need to make it go faster and stop sooner." 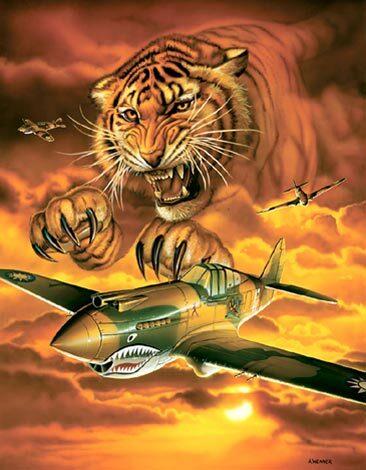 Ape Race parts was chosen to be the Crankshaft specialist for the "Flying Tiger" build. Jay at APE has been building our crankshafts for many years and we have never been happier with their performance over the years. When we built the 1397CC Nitrous "Tiger" bike and broke and reset all the Nitrous records for the 1 mile short course, Jay was there for us every step of the way. His precision work in lightening, knife edging, balancing and modifying the oil ports in the cranks has always given us the edge in being able to tune for such high horsepower with Nitrous and even today that has not been equaled. Making a 200hp shot of nitrous work and keeping the motor together for over 18 seconds of nitrous usage is a testament to Jays engineering prowess and expertise with crankshafts. Jay is a self taught crank shaft genius who has been in business over 37 years. Finally Jay bought some land in the upper desert of California where they moved into their new building at Willow Springs Raceway in 2006. 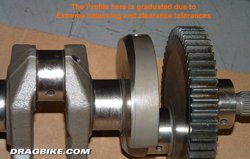 They were the first company to offer the profiled lightened cranks for motorcycles. APE started doing it for the Honda 750s, back in the 70s, when they were the hot item. I know that my old 79' CB750F had one. They have been doing it for over 30 years and most of the top racers use them and recommend them. I know I do and always have since using them for the first time back in 2001. When I asked Jay "How did the name APE come to be?" He said that "We wanted a name that the initials meant something. We chose American Performance Engineering, so it would be APE and we could use a monkey in ads which we did in the early years." A monkey? Here are some of the other major products APE is known for besides cranks. How about cam sprockets, cam chain tensioners. Valve springs and Titanium retainers along with Engine stud kits just to name a few. 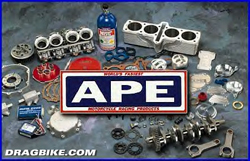 Worlds Fastest Motorcycle Racing Products Company, APE. We purchased 2 new crankshafts from Suzuki Motors and sent them to the world renowned crankshaft artist and builder, Jay at APE Race Parts otherwise known as American Performance Engineering. 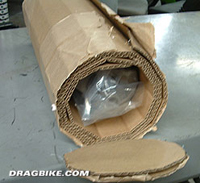 Our crank shaft showed up here at Tiger Racing packed in what looked like a cocoon of corrugated fiberboard (cardboard for you rookies). It was packed very well so you know your crankshaft is well protected when it is returned to you. Of course, APE receives crankshafts packed in all sorts of ways and I would say to you that you should protect your investment carefully and pack it well, actually pack it as if it were a crystal chandelier being shipped on a donkey wagon. 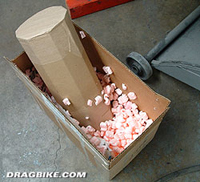 Your crankshaft deserves the best packing you can do. 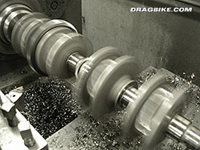 APE removes excess weight from your crankshaft and then balances it to race specs. Lightened crankshafts rev much quicker. The re contoured counterweights have less drag spinning through the oil mist resulting in more power to the wheel. 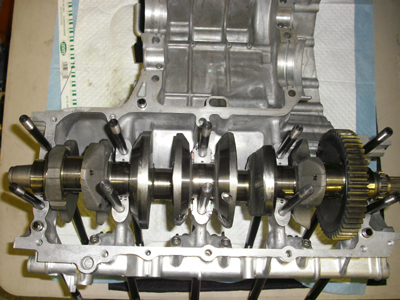 (The crankshafts pictured here have had counterbalance gears removed - optional.) 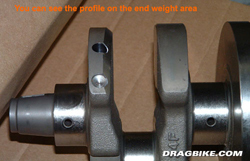 The crankshafts have the oil holes modified to provide more oil to the bearing. Then it is computer balanced for continued operation to 14,000 RPM. 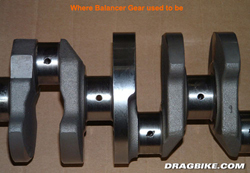 Lighten and balance customer supplied crankshaft. Here is the crankshaft being cut and shaped and balanced along with the journal polishing. The advantage of a lightened crank... Much quicker throttle response, less power wasted trying to turn a heavy crank means more power to the rear wheel. The engine accelerates faster. Harder pull off the corners. Reshaped counterweights move through the oil mist with less drag. Lighter cranks have less gyro effect. We needed to reduce the weight and we need it balanced perfectly, now I’m not asking much, am I? Not for the boys at APE! 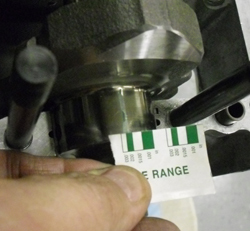 We measured the main and rod journals with a micrometer that is capable of measuring down to 0.0000". Each journal measured at 1.5739" - 1.5740". 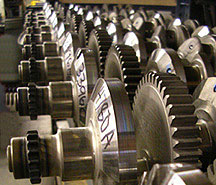 This is so that we could match up the Case #'s to the Crank journal sizes so that we could order a set of main bearings. 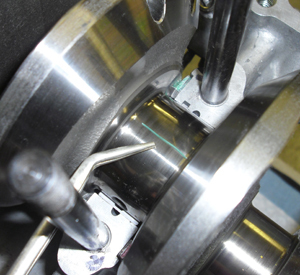 Once the main bearings arrive, we will plastigauge the journals to determine the exact clearances. When building a large motor like this, it is so important that exacting tolerances and clearances be obtained. 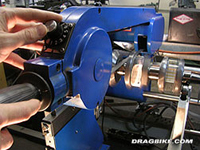 You want all of your parts to be properly lubricated when connected to the crankshaft spinning at over 11,000 rpm's. You do not want to have uneven friction points possibly causing harmonic vibrations to your crankshaft. Each main journal bearing needs to have the same oil clearance as the other 4. We installed the APE 1/2" Head Bolts into the upper case per the provided instructions making sure the long thread was inserted in the cases. We are going to need all the help we can get to contain the pressures generated by making 600hp in this motor. APE is the leading manufacturer of heavy duty cylinder studs for motorcycles. The Hayabusa studs are made from ultra high heat treated premium 8740 steel and feature rolled threads for maximum strength. Torque to 60 lbs. 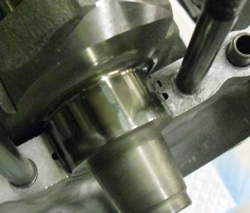 APE head nuts are machined from billet stock and heat treated to prevent threads from stretching. This set up is a must for all serious go fast motors. Extra thread on the nut end allows them to also be used with no plate when using APE CHN10125-10 cylinder head nuts. APE has a complete assortment of 1/2" diameter cylinder studs for the Hayabusa. These studs are made from heat treated chrome moly steel, fully ground with rolled threads for maximum strength and the only studs we use at Tiger Racing. They come with special machined twelve point nuts and washers designed to fit in the busa head with no modifications. Who would need these studs? The guys that have had their cases re drilled and tapped 1/2-20 and find that they are stuck with having to use allen bolts. Studs are the preferred fastener choice for high performance engines. Unlike a bolt, a stud uses all of the threads in the case, and it doesn't have to be removed during disassembly which adds wear on the case threads. 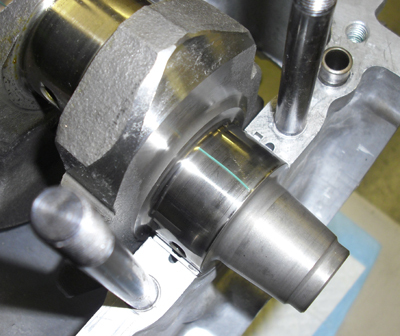 Studs don't twist like bolts when being torqued down, so torque readings are more accurate. If you have had your cases tapped out thinking those big bolts were necessary, at least now you can use studs. For the Suzuki Hayabusa, heat treated chrome moly main bearing studs. These studs feature rolled threads, center less ground surfaces, and come with competition style twelve point flange nuts. As racing's leading supplier of heavy duty engine stud kits, APE already has their very popular top end cylinder studs for the big Suzuki, and now turned their attention to the bottom end. By replacing the bottom end bolts with heavy duty studs, it helps minimize the chances of high output engines trying to separate the engine cases at the crank center line resulting in oil pressure loss and possible engine bearing failure. I wouldn't dare build a motor without them. Hot rodders have already pushed the power of these engines to over twice what the factory intended. As with all engines with this power output, heavy duty fasteners are mandatory to hold them together. I'm planning on pushing them over 3 times what the factory intended. Buwahahaha! They really are a thing of beauty once they are all installed and standing proud. Next was the bottom end bolts. Wrenching these bottom end babies into place was easy enough and I even remembered to install the 3 tall ones in the middle front row outside. When you look at the opposite case, you will easily see why you need to get the right bolts in the right holes. As you can see here with all the APE Heavy Duty bolt kits installed, it truly is becoming an thing of beauty. The Tiger Racing Engine Stand allows you to rotate cases and work on either end without having to remove the engine from the engine stand. A really cool idea. The main bearings arrived so we installed them using the chart from the crank BCBCB and the chart from the cases AAAAA, I ordered the main journal bearings from Suzuki. Blk-Brn-Blk-Brn-Blk. Now if you have never ordered bearings using the stampings from the crank and the stampings from the cases, I recommend you get a technical manual for the Hayabusa from your local dealer. But even though I used the chart, I still used Plastigauge to measure my oil clearance properly. From the picture on the right you can see the small thin piece of Green Plastigauge I have layed on the journal. With no oil and not turning the crank, I bolted the other half of the cases together and torqued the APE Heavy Duty crank bolts to 25ft-lbs. I then removed the crank bolt nuts and removed the lower half of the cases revealing the plastigauge strips I had layed on every main journal. All the journal clearances measured at about 0.0025" all the way across all 5 main bearing journals. Since this measurement not out of limit and they are all exactly the same, I can be sure of good oiling and that all 5 main journals are equal. I used the Green Plastigauge for this measurement. This is something i do on every Journal for both the mains and the rod journals. Something my old friend Dave Owen taught me years ago. So there you have it. The crankshaft has been lightened, balanced, balancer gear cut off, oil port holes chamfered, bearings installed and Plastigauged. APE, American Performance Engineering at its best! Whether it's a stock crank with minor polishing work done, or a super race crank (like ours) with all the modifications done, you simply can't go wrong with APE as your supplier of bottom end components. There just is no alternative to refined success when building race motors. After all is said and done, if your crankshaft is not ready to handle the extreme pressures that a Big Bore Turbo Motor will put upon it, then you have lost before you started. I can’t stress enough how important your crankshaft is to the overall performance of your motor and it’s connected parts.